Every new user is free to use this software because it is easy and straight forward to use. 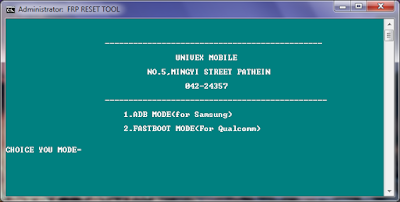 In most of Qualcomm and other Android phones you will have fastboot option. After all this, you can restart your device and enter any user name to start your phone. I will admit for the first time I am stumped. As we all know if the adb mode or usb debugging is enabled on the device then we can easily bypass Samsung frp using Miracle box 2. If you want to download this tool on your windows then follow given download instructions which are given at the bottom of this page. Only remove the lock screen, no data loss at all. Several times users are asked to give logcats of their devices which are giving errors. It covers latest versions and the team keeps it updated. So with commands written below you can also remove frp via fastboot. When you do the factory data reset on your smartphone, then all sets are back the default setting, and all data is erased with the downloaded app and files. For that, if an unauthorized people try to reset your device by the one more method, this phone would still require the login by using the google account and password. Now you need to put your Samsung phone by using press your vol-, power, and home button together. Hence, it is important to know how to bypass a Google Account. It is really useful for developers to see which component has malfunctioned and helps to narrow down their search for what failed and what needs to be fixed. Note; If in case download link will expire or damage by infected files then tell us in comment section we will change download link to update. Credit ©: Ray Marm Aung All right reserved. Whatever the passcode you choose, you won't lose any data on your device by removing it with dr. I just work around it. The latest version has included lots of latest and updated functionality features which can help to easy your way. If you forget your google account username and password and you already reset your device. You can also share this tool with your friends and family. Here on this page, we are sharing its official download link, you will find and download it for your windows. You can also download this file by click the link. Well, these commands can be initiated from your device too but they can be initiated from adb also making it easy for programmers. No data loss at all. I have access to launcher the settings menu and any other aspect of the phone. Then open the Z3X tool. Combination firmware is required to run this software. It does not work with other models besides Samsung. It comes with a detailed guide. If you are interested in this amazing tool, then what are you waiting for? If you encountered any problem , feel free to ask just leave a comment and I will answer it as soon as I can. Pushing is also very useful command. Now, wait few minutes for complete the flash, when it complete your device will be automatically restarted. Pushing and Pulling: Most used commands of adb. The downloading, as well as the complete setup, take a few minutes.